Fig. 3. Induction of reporter transgene with hyperbaric oxygen. (A) A young adult animal from reporter strain CL2166 (grown in ambient air at 20°) was mounted on a slide and imaged (left), and then returned to a solid agar medium plate and exposed to 40-psi hyperbaric oxygen in a pressure vessel for 4 hr. After a 3-hr recovery in ambient air, the animals were remounted and reimaged, using identical exposure conditions. Note the extensive increase in GFP expression in multiple (neuronal, intestinal, muscle, etc.) tissues. (B) Cohorts from three independent reporter lines (18-20 animals per strain per condition) were either exposed to 40-psi oxygen or maintained in ambient air as controls. GFP expression in each animal was then quantified with a digital camera and NIH Image software, and is expressed as mean pixel density. Image software (NIH, Bethesda, MD).14 Shown in Fig. 3B is the quantitation of GFP expression in response to a 4-hr exposure to 40-psi oxygen for these three transgenic lines. This level of oxidative stress produces a 4- to 5-fold increase in GFP expression in these animals. 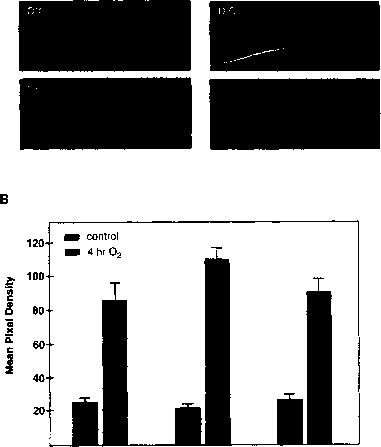 (Exposure to 40-psi air does not result in increased transgene GFP expression, indicating that this is clearly an oxidant stress effect, not a simple effect of pressure.) Similar analyses show that, as expected on the basis of the derivation of these reporters, exposure to juglone and paraquat also produces strong GFP induction in these animals. Although GFP-based reporter constructs have been used previously to visualize oxidative stress-dependent relocalization of NF-kB15 and protein kinase B,16 few published works have described the use of GFP reporter constructs to specifically monitor the transcriptional response to oxidative stress. Our work with a limited set of reporter genes demonstrates the feasibility of this approach, and suggests a number of useful applications. For genetic model systems such as C. elegans, oxidative stress-dependent induction of GFP expression represents a phenotype that can be the basis of forward genetic screens. 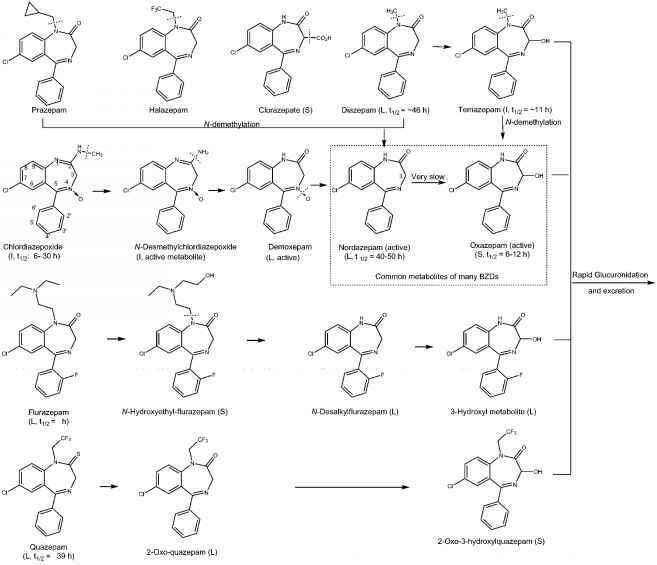 These screens can potentially identify genes involved in the induction of oxidative stress response genes (e.g., transcription factors and oxidative damage sensor proteins), or genes that can be mutated to preemptively block oxidative stress in the first place. More generally, oxidative stress-dependent GFP reporter transgenes can be used as surrogates to measure oxidative stress. For example, our initial rationale for developing these reporters was to create a tool to determine whether transgenic expression of the human -amyloid peptide in C. elegans17 resulted in oxidative stress. Given the well-established relationship between aging and oxidative stress,18 these reporters may also be productively applied in studies of aging. Because GFP expression can be readily adapted to high-throughput assays, oxidative stress-dependent reporters can potentially be useful for screening chemicals for either prooxidant or antioxidant effects. We thank Amy Fluet for construction of the pAF15 reporter plasmid, Edouard DeCastro for outcrossing of the CL2166 strain, and members of the Link and Johnson laboratories for advice and assistance. 14 S. L. Shaw, E. D. Salmon, and R. S. Quatrano, Biotechniques 19,946 (1995). 15 K. Tenjinbaru, T. Furuno, N. Hirashima, and M. Nakanishi, FEES Lett. 444,1 (1999). 16 A. Gray, J. Van der Kaay, and C. P. Downes, Biochem. ]. 344, 929 (1999). 17 C. D. Link, Proc. Natl. Acad. Sci. U.S.A. 92, 9368 (1995). 18 R. S. Sohal, R. J. Mockett, and W. C. Orr, Probl. Cell Differ. 29,45 (2000).